Ah, the Great British Summer: a time of intermittent thunderstorms, complaints about the cold/rain/heat (depending on which of the seasons the day most resembles) and abject England batting collapses. John Cleese provided an insight into the English cricket fan’s mentality in his movie Clockwise: “It’s not the despair, Laura. I can take the despair. It’s the hope I can’t stand.” After taking a first innings lead off a superb bowling performance, England have once again played Lucy to a nation of Charlie Browns: as I write, they’re 100-7 and doing their best to increase that final digit. Bah. Let’s start with something controversial: Gregory Clark and Neil Cummins use data on surnames in pre-industrialisation England and Wales and subsequent census data to argue that the North-South divide is an artefact of the migration of ‘high-ability Northerners’ to the South. They conclude from this that any attempts to mitigate the North-South divide is good money after bad and a dead loss. Their argument is that those ancestral Northerners who move to the South are very high-achieving, while Southerners who move North are not; there’s more in this vein too. I’m a bit dubious. For one, regardless of whether their research really does show that ability is the only difference between North and South, I’m not sure the argument for investing in the North is simply about maximising GDP. It’s about parts of a country being left behind and disconnected; this might have further economic or political ramifications, anyway. 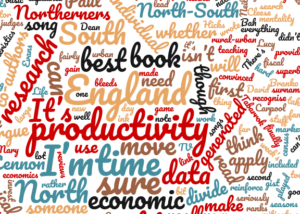 I’m also unconvinced by this ‘northern names’ strategy – but I need to think about that more. “If I didn’t have the use of email, internet search and a mobile phone, I would need to employ someone as a personal assistant. But I have had these tools for a long time, so I have never had a secretary.” Is this technological job destruction? Tim Harford being sensible about technological change and its economic effects. The first test to apply to someone who claims that it will be different this time is to make sure they understand how it happened last time. Paul Krugman, explaining macroeconomics on a rollercoaster. Like Tabarrok, I am not convinced this is the best gimmick to apply to economic teaching. How about explaining economics during a game of dodgeball? (PS – England are doing the hope thing again. Curran has made a half-century). Joan Hicks and co-authors make me seriously question my priors (and reinforce link 1). They argue that the productivity gain apparent in rural-urban migration is in large part down to individual productivity, rather than urban work being more productive. I’m not sure this research really closes the book on this, though. There’s a second question too: if productivity differences are explained by individual characteristics, why do the most productivity people systematically move? David Evans is so well read I am fairly sure he bleeds printing ink, and here he reviews Mary Kay Gurgety and Dean Karlan’s book on evidence for the Social Sector. The gist of the book is that there is a lot of valuable stuff you can do that isn’t quite an impact evaluation, a fact too often neglected. I agree entirely, and think that most organisations (ourselves included) invest too little in basic monitoring data. Branko on decomposing inequality into the inequality generated by the market and that generated by the fiscal system, summarising new research with co-authors. As with everything he writes on inequality, just read it. You will become better informed. And finally, this week’s marginalia: can statistics recognise whether Lennon or McCartney wrote a song? It appears so, and it judges In My Life to be a Lennon song. On that note, the Paul McCartney Carpool Karaoke was brilliant – though it’s hard not to be with those songs. And The Ringer ranks the best 100 TV episodes of the century so far. Incredibly, Pine Barrens isn’t number 1, and neither is Mister Wu.